As always, goalkeeping has been a hot topic so far this Premier League season with many being scrutinized for their lackluster performances and on the other side of the coin, many hitting the limelight. So with the season now halfway through, it is time to take a look at which five goalkeepers have made the greatest impact for their teams and which one’s have been more of a detriment than anything else. Saves per goal is the best way to look at how successful a goalkeeper has been over a given period of time. Other statistics like number of clean sheets, total saves or average goals conceded per game may actually be strongly affected by how strong or weak the defense in front of the keeper performs. Saves per goal on the other hand only looks at how goalkeepers have responded when they’ve been called upon and does not leave anything else open to interpretation. For example, a goalkeeper at a team fighting for relegation will obviously face more shots per game than the average Premier League goalkeeper, but if they are up to the task, they should still manage to save far more shots than they let in. Similarly, a goalkeeper playing for one of the league’s elite clubs may face comparatively far less shots but if they are up to the task, should still be saving the vast majority of them. So without further ado let’s get to it! These are the five best and five worst goalkeepers in the Premier League halfway through the 2017-18 season based on saves per goal. 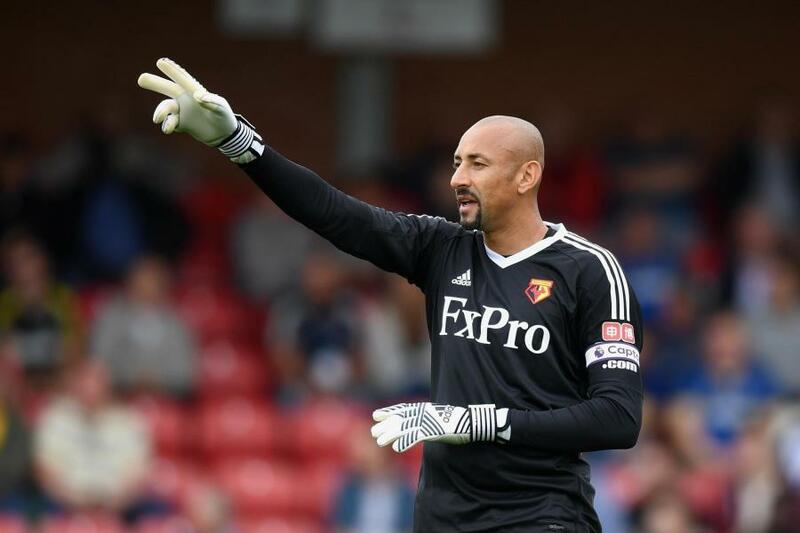 The surprising name as the fifth worst goalkeeper of 2017-18 so far is Watford’s eccentric keeper, Heurelho Gomes. The Brazian keeper has been on top of his game for the most part when called upon, but the stats don’t lie and suggest that Gomes hasn’t saved that many more shots than he’s let in (1.5 saves per goal conceded). Watford have been flying high this season, currently sitting in 10th place in the table and on the surface it seems as though Gomes has been a big part of that. Statistically speaking however, it seems he has not been as great as he probably should have been for the first half of this season. Ben Foster has not had an easy time between the posts this season for West Bromwich Albion and the club currently sit in second last, without a win since Matchday 2. To be fair to Foster, not a single West Brom player has had a good start to this season (bar Ahmed Hegazi) but 1.44 saves per goal is still nowhere near good enough and calls into question his possible place at World Cup 2018 for England. Another British goalkeeper with a good reputation, Jack Butland has not been up to the task this season for Mark Hughes’ Stoke as they sit below their usual position in 13th. This is a surprise given that Butland was one of the top keepers not too long ago. To make matters worse, at this time last year, Lee Grant (Stoke’s number 1 for 2016-17), was top of the charts with 3.67 saves per goal. Butland has to have a good second half of the season if he is going to have any shot at making England’s World Cup squad. As long as Simon Mignolet starts in goal for Liverpool, he will always be criticized. It seems as though from the moment he arrived at Anfield, he had a big cloud hanging over his head that has never left his side. This season has perhaps been Mignolet’s worst ever and statistically speaking, he’s been worse than nearly every other keeper in the league. Mignolet’s only conceded 1.28 goals per game, but he’s also only made 1.50 saves. This suggests that Liverpool don’t face a lot of shots but that when they do, Mignolet can’t save them. The sad thing is that Jurgen Klopp still doesn’t have a better replacement. Loris Karius has only made 2 appearances this season (not enough to count on this list) but has an even worse saves per goal return of just 1.00. Many would have thought that Joe Hart’s move to West Ham would be the thing to save his career and secure his spot in Russia 2018. But the sad truth is that he’s actually regressed since moving to West Ham and since David Moyes has come in as manager hasn’t even been able to get back into the side. Joe Hart was in goal for West Ham’s torrid run of form – August to late November, when they won just two matches. In that time, Hart faced 63 shots and only saved 33 of them. That means that he conceded 30 goals in just 14 matches and only kept out 3 more shots than he let in. This is one of the worst saves per goal ratios of keepers to make 10+ appearances in the Premier League all time and has certainly put his place in Gareth Southgate’s squad in serious doubt. Chelsea’s number 1 goalkeeper, Thibaut Courtois, has certainly been up to the task this season and has secured his side a significant amount of points this season. Courtois has almost become underrated in recent times as all the attention continues to (deservedly) be thrust upon David De Gea, but signs continue to show that he is one of the very best keepers in this league. The Belgian keeper has kept 10 clean sheets in 20 matches this season, conceding just 0.70 goals per game. Chelsea’s defence has been excellent so far in 2017-18 and Courtois might be the best of the bunch. Pep Guardiola’s latest goalkeeper signing has worked out much better than his first in Claudio Bravo. Ederson has been fantastic in goal for Manchester City and is one of the main reasons why the team remain on the longest win streak in the history of the league. He’s such a smart keeper, rarely ever making mistakes, while just the way Guardiola likes it, he’s also good with his feet. 0.63 goals conceded per game is the lowest of any keeper this season while his ratio of 2.6 saves per goal conceded is the fourth best in the league. Ederson has certainly made a difference for Manchester City this season and deserves loads of credit for their stellar early form. A surprising name toward the top of the chart, Matty Ryan has had a great start to life at Brighton and Hove Albion. Simply put, Brighton face a lot of shots; one of the most in the league. But Ryan has always been up to the task and has saved far more than he’s let in. 2.9 saves per game is bested by only a few keepers in the league while only conceding 1.21 goals per game is highly impressive for a newly promoted side who face as many shots as they do. It’s also better than Simon Mignolet, Kasper Schmeichel and Jordan Pickford. Matt Ryan is not thought of to be one of the best goalkeepers in the league, but if he continues on at this rate, maybe that should change. David De Gea has been without a doubt, the best goalkeeper in the league this season. He’s been fantastic for Manchester United and with highlight performances against Arsenal and Bournemouth, it’s been another season that has only enhanced De Gea’s reputation as the best goalkeeper in the world. As good as United’s defence have been, De Gea has had to face 78 shots so far this season and has only let in 16 of them. How is that for a stat? 3.10 saves per game is only bettered by the number 1 keeper on this list (of keepers to make 10+ apps) while 0.80 goals conceded per game is only bettered by that same number 1, Courtois and Ederson. 3.88 saves per goal is absolutely outrageous and had it not been for the heroic exploits of the number one player on this list, David De Gea would be the unequivocal answer to the question of who has been the best goalkeeper in the league so far this season. Burnley’s captain, Tom Heaton, has a reputation of being one of the best goalkeepers in the league and was practically single-handedly the reason the Clarets stayed up last season. He would have been impossible to knock off the number one spot in net for Sean Dyche’s side but after dislocating his shoulder at the start of the season, Nick Pope was thrown into the action and hasn’t disappointed one bit. Burnley’s defence have been excellent but without Nick Pope, they would practically be nothing and would not be sitting in 7th place in the table right now. In his 17 appearances so far, Nick Pope has only conceded a stunning 0.76 goals per game (only Ederson and Courtois have conceded less). To make matters even more incredible, the British keeper has made 3.17 saves per game. That’s 67 shots faced this season and only 13 goals conceded. Nick Pope has been amazing this season for Burnley, so much so that some are even beginning to call for the 25-year old to be called up to England’s next squad in preparation for World Cup 2018. So there it is! The 5 best and worst goalkeepers in the Premier League so far for the 2017-18 season based on saves per goal. Like what you read? Click the follow button or check us out on Twitter. See you soon!